My first trip to Vancouver Island's premier wild steelhead river in the late sixties was an experience I will never forget! A new highway, gravel, had been built to reach the instant town of Gold River. The town had been built about five miles upriver from the pulp mill that was constructed at the river estuary on Muchalat Inlet. It was mid July and we were in fact focused on fishing the Heber River for summer steelhead on a section of water a few miles above where the Heber enter the Gold River. After two fishless days on the Heber, working various dry and wet fly patterns, we finally decided to fish the mouth where it enters the Gold River at the town site. I can still recall our surprise when we first saw the Gold River. It was a typical but large west coast Vancouver Island river. But, it was the colour, that clear golden yellow colour from various suspended sediments which held us glued like magnets as we stared into the fishiest water I have ever seen. Our awe was sharpened when we actually saw a leaping steelhead in the Heber Pool. Two exciting, 'no-see-um' filled days later we each had beached fish and vowed that we would be back. The highway has changed considerably since that first trip! Now it is a paved, first class highway taking the traveller through one of the most scenic areas of Vancouver Island. From the major service center of Campbell River it is a 75 minutes drive to Gold River. Anglers new to the area should note that there are no services between the two communities. Campbell River, the "Gateway to the North," as it likes to be called, is situated about 350 kilometers north of Victoria (185 miles), and is a four hour drive from Victoria, British Columbia's capital city. The drive to Gold River from Campbell River is best divided into two sections; Leaving Campbell River the highway winds as it passes numerous small lakes and meadows, then curves back and forth as it follows the shoreline of Upper Campbell Lake. 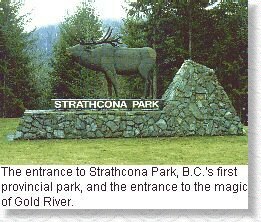 It enters Strathcona Park, British Columbia's first provincial park, at the isthmus which divides Upper Campbell Lake from Buttle Lake. This first 45 minute stretch is not recommended for speed during the winter mornings due to icy conditions. Crossing the isthmus, the road winds for only a few kilometers and then straightens as you enter the estuary of the Elk River. The highway follows this sparkling and fishy river course, through the high peaks of the Vancouver Island Mountain range alongside elk meadows and small lakes, to meet the Heber River, the Gold River's premier summer steelhead tributary. Once at the Heber River it is but a few minutes downhill drive to complete this second half, about half an hour unless you have stopped to watch the Roosevelt elk herds and Columbian Blacktail deer which are a common sight in this stretch during the winter months, forced down to these bottomlands by intermittent snow. 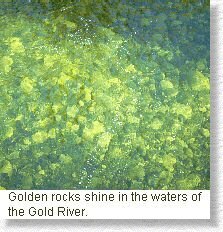 Every time I drive that very fishy paved five mile stretch of highway parallelling the Gold River, between the town site and the pulp mill at the estuary, I marvel at the foresight of our pioneers who so accurately named this, the Gold River! The river's golden green water shimmers with the color of the early deciduous leaves of spring, a harbinger of bountiful days and successes yet to come. My favourite pool on this enchanting river of wild steelhead lies downstream from the mouth of the Ucona River. It is a pool with easy access, situated downstream from the deep pools of the lower canyon. From the car park one can hear the welcoming bubbling waters of the river and, as always, the anticipation is high when I strike out on the short trail to the riverbank, then, move upstream to the sloping pool where the steelhead like to lie. For me this is a pool of oddities. How well I remember one trip when I discovered my fly line kinked in the reel and spooled out in a bird's nest tangle the like of which I have never seen before or since on a fly reel! I was standing in hip deep water at the time, with about thirty feet of fly line trailing downstream while in frustration, I manhandled the tangle. A sudden jolt tore the rod from my hand but, fortunately, I still held onto a single coil of fly line. Rod and reel shot into the fast water and submerged as a bright doe steelhead catapulted downstream, searing fly line through my hand on a long long run. Somehow I was able to keep a hold on that single coil of line even when the thin backing began to tear through my fingers. Finally, the fish settled behind a large boulder and held, giving me time to handline in the river pulsating rod. Somehow the fish had cleared the line tangle in her mad dash downstream and I was able to play her out to the beach where I released her. Another time, on the same run, I had worked the pool thoroughly without a single strike or nick to indicate a holding fish. Looking through my fly box, I decided to try a fluorescent lime green Thor pattern, one which had sat in my kit for at least two seasons. I had found that this color was successful for active coho in saltwater and felt it might interest steelhead. It did! Two casts saw me into two separate fish neither of which I was able to beach but, both gave me a good fight in the fast water. This pool has been subjected to a number of local unkind names but, I prefer to call it the Ucona Pool with the downstream water called the Ucona Run. I have found that it is water that holds steelhead at any time of the day and if you are fortunate, as a friend and I were three years ago, you also might hook and release 25 plus fish in a single afternoon. 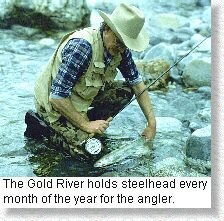 The Gold River is Vancouver Island's premier wild steelhead river. With the introduction of steelhead hatchery programs on Vancouver Island in the early 70's the Fisheries Branch made a conscious decision to keep the Gold River free of hatchery fish. This decision was supported by organized anglers including the Steelhead Society of B.C. and the B.C. Wildlife Federation. The fact that this has been the right decision is amply shown by the annual successful angling catches. I strongly believe that any decision to add hatchery stock to the Gold River, would mark the end of that unique quality of wild fish which the Gold River offers to the adventurous steelhead angler. The Gold River, like it's southern popular sister the Stamp River, is a river with good runs of both summer and winter steelhead. But, unlike the Stamp River which has received a heavy hatchery program, almost all steelhead on the Gold are wild steelhead. 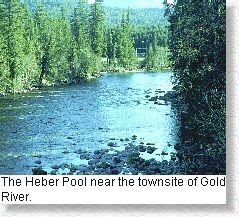 The Gold River is unique on Vancouver Island for it is a river with runs of steelhead which prefer to hold in the lower section of the river. In parts of that lower canyon they are inaccessible but, other sections will astound you for the number of fish that they repeatedly hold every month of the year. To experience the Gold is to truly experience the 'wild' aura of west coast steelhead fishing.